Coming back for a second year, The Gingerbread House Challenge returns to the Hancock museum on Sunday December 1. Held in partnership with The Sick Children’s Trust, the charity event is all about building and decorating gingerbread houses, with prizes for the best ones, guest judges, and a general “now I’m in the mood for christmas” vibe. Expect to see some a good mix of works of art from some pretty good home bakers, and some DIY disasters, as well as Santa himself, and christmas/gingerbread themed stalls & things to do. We meant to enter last year but the festive rush conspired against us, so this year we thought that having also missed Cakebook, we better give it a bash. It’ll be easy, we thought. Bake some cake, stick some sweets on it. A ha. 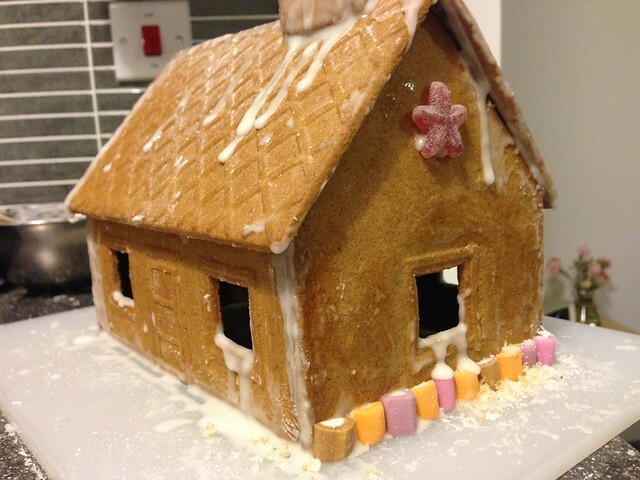 Having never made gingerbread before, we used a kit for our house as a trial to see how difficult the basic construction and decoration was. Quite, as it turned out! Expect this kit from IKEA (£2.45) to be popular on the day as it is cheap, and its gingerbread is nice and firm, so pretty good for structural integrity. It smells good too, but can’t vouch for its taste yet. If you’ve never done this before, or don’t have a degree of patience, expect some swearing and/or throwing cake about when the damn thing won’t stand up. Making your own gingerbread? You have our respect. Icing, it will get everywhere. Make it thick and gluey and care less about taste and more about drying like cement. Getting those walls together is all important – so spend some good time here. A tumbling roof will be funny for everyone, but potentially embarrassing/heart crushing for you. Toppings/decoration – go crazy. Use rolos, smarties, candy canes or whatever it takes to hide the flaws in your design or any leaky icing. Bear in mind extra weight will have an affect on structural loads! The main prizes are for decoration, so this is your chance to let your flair shine through. Last years entries were super impressive and the standard this year will be no doubt even better, but bear in mind that it’s the taking part that counts. Fingers crossed that on the day, we will show something a bit better. If you fancy a go – and please do, IT’S FOR A GOOD CAUSE and entry is merely a fiver donation to The SCT. Come down on the day and have a laugh at our effort – likely to be ambitious, but rubbish, and other potential #pinterestFails. Then eat loads of cake at the end. Book your place sooner rather than later at the link below, or contact the canny team on Twitter at @gingerbreadhc. Event is Sunday 1st December 2013 2-4pm at Great North Museum, Newcastle.